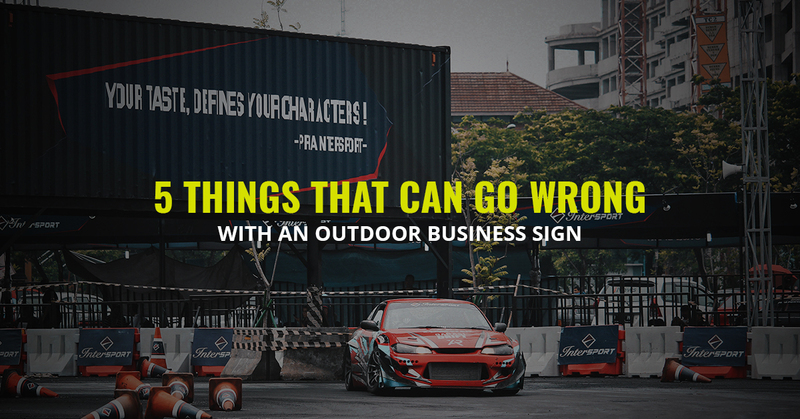 Outdoor Business Signs: What Could Possibly Go Wrong? When you take a look at our gallery of outdoor business signs, you’ll notice that they all look really good. There’s a variety of standard outdoor business signs, lighted exterior signs, custom on-building signs, and in-ground wayfinding signs. What didn’t we put up there? The signs that don’t work because our customers wouldn’t listen to our advice! What can go wrong with an outdoor business sign? Let’s take a look at the most common mistakes that are made during the sign-making process. Back in the 80s and 90s there was a catchphrase that everyone and their grandmother drove into the ground: “TMI!” This phrase, of course, means too much information. The amount of information delivered by a sign is both an art and a science. If you give a customer too little information, you risk them not knowing what the business does. They might drive past it for years and not stop by or be enticed to even discover what you sell. But giving them too much information can also be a problem. Consider a wayfinding sign on a hospital campus. If it’s trying to identify each and every practice, no one will be able to take it all in as they’re driving by. It might be better to identify the specialty of the building and then break down each practice by a second wayfinding sign later. Of course, the speed at which people are moving also has to be taken into account. For outdoor business signs that are trying to deliver instructions, a broad approach is often better than a specific one. Deciding how much information to put on an outdoor business sign is a difficult balance to find, so make sure you seek out an experienced sign shop that knows just how much information to include. But sometimes the color that looks good on letterhead simply doesn’t work on an outdoor business sign. Sometimes what looks good on the web will be a horrible choice for outdoor banners. A sign shop should have the experience to know what will and won’t look good on the outside of a building, as well as if the chosen colors will have enough contrast when placed against the building itself. 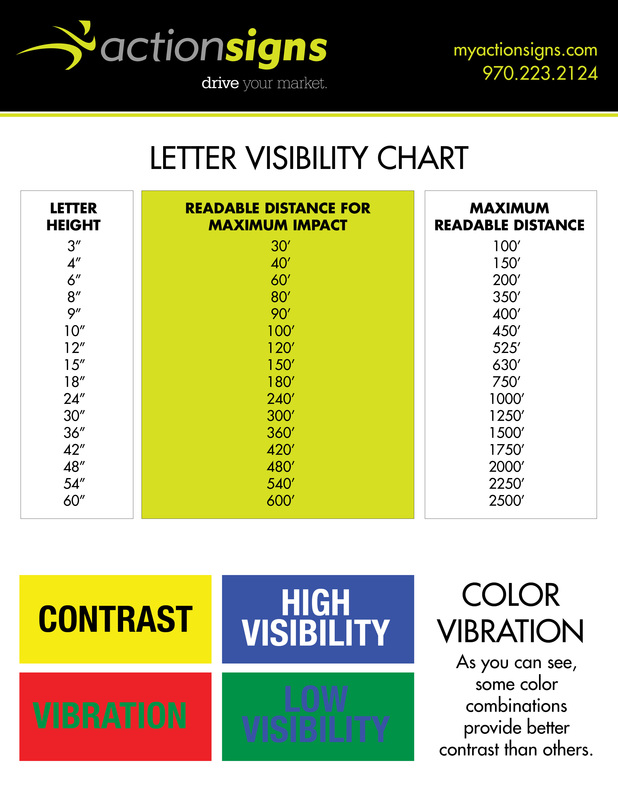 Click here to check out our sizing and contrast chart to get an idea of what your sign might need to include. We understand that some of the companies that come to us have hired a marketing company to come up with a brand guide, a document that details the colors and fonts that must be used. Unfortunately, those brand guides often only consider the colors when printed on paper or viewed on the web. Few of them ever consider what a 20-foot-wide outdoor business sign should look like. Trust us, we have respect for the marketing company that comes up with a clever logo in order to match the feel of the business. But sometimes the idea of “this logo can’t be changed and it’s the way it should always be” get’s pounded into a customer’s head by the marketing company, and the customer isn’t willing to compromise when it comes to making a custom sign that contains the logo. Some logos are simpler than others — take a look at the original Apple Computers logo to see how it’s been drastically simplified over the years — and translate well to large outdoor lighted signs. But others are more complex, and allowances have to be made if a sign is going to be shaped from metal. If the logo isn’t simplified (or regulated to a better place on the building, like on the window film), then it could simply be unrecognizable when it’s above the awning. Look, we’re not naming names, but there was once a store in Loveland with a business sign that we couldn’t read. Well, we could read it, but we had to stare at it for a while. It was trying to be hip and cool, using different colors and tilted letters. What did this business do? It was a sign shop. Believe it or not, this company created a sign that was almost impossible to read, even though they were inviting people to use their services as a sign shop. But they didn’t take one of the most basic ideas into account, that the font you use is incredibly important. If a customer has to stare at it before they can find out what the company is and what they do, the sign isn’t doing its job. Signs should be able to be read at 40 miles an hour in town, and at 75 miles an hour if the building is near the highway. A quick glance is all it should take to identify a business. The way a sign is designed can actually play a part in how well it performs. If a sign is designed so poorly as to trap rain, snow, and ice in the wrong place, it could start falling apart after the first winter. There’s more that goes into outdoor sign design than most people think, and experience matters. Of course, the wiring of the sign is incredibly important. If a lighted business sign isn’t wired properly, the sign could become useless at night. It could also cause parts of it to go out, which gives a customer a less-than-positive impression of the business itself. Of course, there are also those times when a partially out sign can send the wrong message. Choose Experience Outdoor Sign Designers! When you choose to work with Action Signs, we want to do what’s best for your business. We would love to work with you to get you the best sign possible. Contact our sign shop to get the process started!